I don’t like to do much cooking in the summer that doesn’t involve a grill. 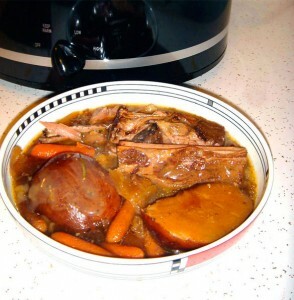 However, this pot roast uses a slow cooker and is easy to make. If you don’t think of it as the perfect summer food, let this be a prelude to the autumn that lies before us. Score and sear pot roast in a skillet until browned on all sides. Put all ingredients in the crock pot or slow cooker, and leave for at least 6 hours, until the roast is falling apart. Serve with crusty bread and enjoy!